While I was at a wedding expo looking for wedding ideas, I heard an amazing band performing in the background. I ended up watching them for at least an hour and decided that I needed this band!!!! Both my husband and I agreed and we put down on deposit on the spot. On the night of wedding we couldn't get people off the dance floor. Even the videographer commented that usually it takes hours to get footage of people dancing however we did it in about 3 songs. No one wanted the night to end, not even the staff from the hotel. People still talk about our wedding and the amazing band we had. 12 years later we took our2 children to see the band perform and they were just as incredible as the first time I heard them. Thank you Renee and crew for making our wedding so memorable. We look forward to more performances in the future. We are your biggest fans!!!!!! Shaded Soul played at my daughter's wedding. They were fantastic! We couldn't stop dancing. Every time we began to leave the floor, the music started again, and EVERYONE turned around and came back! I was disappointed I had to stop to eat dinner! The music is simply outstanding and infectious and gave a great, uplifting, positive energy to the event. I would hire them again in a second! I'm so glad we were able to provide the music for Melia and Vincent's Wedding at Danfords on Long Island. There were so many people dancing that we didn't even want to stop! The best part of the night for us was when Vincent took the mic and sang (Black magic woman and Shape of you) for Melia. These special moments will be cherished by everyone for a long time. Thanks again for the great review. We hope to see you again at one of our Summer concerts. We hired DJ Soul to DJ at our wedding and couldn't be happier. She was 100% professional and made sure the music was the right fit for us and our guests. Renee contacted us a few times before our wedding to make sure we had all of the details sorted out. She made sure to play the type of music we told her we liked, while also reading the crowd and tailoring to the different age groups. Renee even took note of a song my sister mentioned in her speech and played it for us. It was a really special touch. DJ Soul is super fun and will keep your party guests on their feet. Wedding DJ's can be hit or miss sometimes, but you will have no regrets if you hire Renee! Thank you so much for putting your trust in me to provide the music that you and your guests wanted. Your family was such a pleasure to work with. Thanks again for the wonderful compliments. I really appreciate it. Shaded Soul Band was one of my favorite things about my wedding. I knew that they were good judging from videos I'd watched beforehand and their good reviews, but I was truly blown away by their work at my wedding. They have such energy, verve, and joy for their work; we got tons of of compliments and when the dance floor opened, EVERYONE got up and danced! I've never seen that happen at a wedding! They also paced the energy of the reception really well with music, directing tables toward the buffet, and pumping up the crowd. They played music that we had requested and stayed within the general style of what we wanted, all while providing their own unique take on the songs. One of the best things was that toward the end, Renee sensed that the older people (grandparents, etc.) were feeling kinda left out by the music choices, so she asked me if we could change up the music a bit. This was unexpected but ended up creating some of my favorite memories of dancing with my grandparents, and I was so impressed and touched that she "read the room" and adjusted accordingly. Renee also was an integral part of our ceremony music and lighting. The fact that she showed up so early to figure out a complicated outdoor set-up speaks volumes to how much care and detail she puts into her work. The result was perfect. 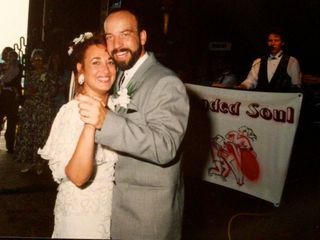 This coming year, my wife Sue and I celebrate our 23rd wedding anniversary. Part of what made our wedding day more special than we could have imagined was our good fortune to have booked Shaded Soul. If you've got a great band your wedding will be remembered for years to come. The band has a huge responsibility to set the tone and atmosphere for the entire afternoon or evening and you have one shot to book the perfect band. Shaded Soul was tight, brought their A-game with great energy, musical ability, stage presence, repertoire, punctuality and reliability. They were wonderful then and even more extraordinary now. Beyond my wildest dreams. Music was a top priority for my (now) husband and me while wedding planning. When we came across the video from Shaded Soul Band, we knew we wanted them at our wedding. We immediately connected with Renee (the band leader). She's incredible. She brought up so many things that we didn't even know we needed to think of (i.e. color of linens for band tables to match the wedding). They even learned the semi-obscure song we wanted for our first dance. She's a pro - not just amazing at her craft (a very talented singer and musician), but also at working with all our vendors to ensure everything went off without a hitch (and even better, without our involvement!). THE BAND THO. The Shaded Soul Band is full of amazing talent (which you always expect), but also really nice, genuine people who went out of their way to make sure the energy in the room was high. I think one of my favorite parts was when one of the lead singers and the saxophonist came onto the dance floor to dance with us. Our guests are still talking about how amazing and fun they were. I highly recommend them for your wedding or really any event. What a wonderful, wonderful evening we had for the rehearsal dinner of our son and his fiancé, thanks to the Shaded Soul Band. They were set up and ready to play on time, had agreed to learn songs that were important to our family, and interacted very well with all of the guests. I had emails a week later from guests saying that they were still singing songs from the evening. It is difficult to find a band that is not only professional, great musicians, but also fun. I highly recommend this talented and organised Shaded Soul Band. Renee and the band are simply the best and were amazing to work with from start to finish. 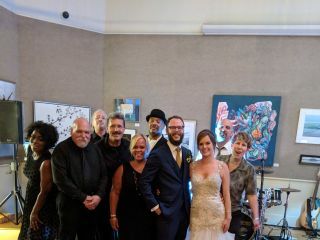 I am thrilled we chose them to be our wedding band; their music and energy are top notch and guests are still telling us how much they loved the band. 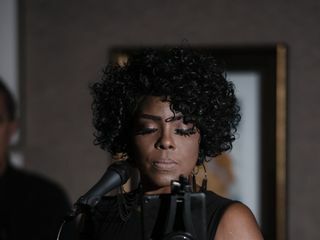 In fact, two couples who were at our wedding in December have already approached me about getting Renee's contact information so Shaded Soul can be the band for their weddings. Shaded Soul Band was astoundingly good, and not just for a wedding band. One of the tighter bands I've ever seen live. Renee was super accommodating and responsive throughout the process. As a musician who loves music of many different genres, I made a lot of song requests and was very specific with which songs I wanted from their website. Renee and the band learned many of the songs I requested, and they absolutely nailed it. Their singers have tremendous power and vocal range, their sax player is amazing, and the bass player 'funkifies' even the most over-done pop songs and makes you appreciate them more than ever before. Simply put, the band is super tight. Renee herself is high-energy, charismatic, and a talented keyboard player and rapper! They even let me play trumpet with them, and we had a blast jamming together. My wife and I never left the dance floor the entire time Shaded Soul was playing, and my wife did a hoola-hoop performance to her favorite song that Shaded Soul Band had learned for her. Most of our friends were dancing raucously for at least 3-4 hours straight. I highly recommend future brides and grooms book Shaded Soul for their wedding. Having a band is really WAY more special and exciting than having a DJ (it just is), and they are the band to make your wedding the experience of a lifetime. We paid for the extra hour, and it was well worth it! 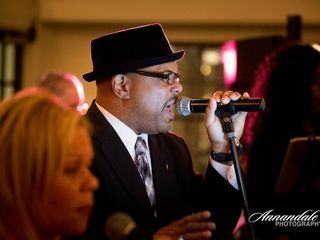 I am a talent buyer for the Willimantic Third Thursday Street Fest and booked Shaded Soul Band in September. I can't say enough about the professionalism of this band but more importantly their talent and enthusiastic performance proved to be one of our most successful festivals. The crowd couldn't get enough of them and my dealing with Renee was very easy. Overall, a most pleasant experience!! I will definitely be booking them again! Shaded Soul Band has played at the Glastonbury Riverfront Music Series 6 times since 2001 attracting over 3,000 attendees. They are outstanding musicians and singers who engage the crowd and get people up to the stage to dance the night away! I've been to smaller indoor events where they did an equally fantastic job. Renee is wonderful to work with and the band is always great. I highly recommend Shaded Soul Band! 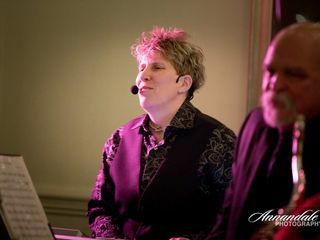 Nutmeg Big Brothers Big Sisters has had the pleasure of working with Renee Prescott and Shaded Soul for over 15 years, most recently, at our Annual Gala. They always bring great, diverse, upbeat music to our events and win the hearts (and ears!) of our guests. We HEARTILY endorse them! These guys are awesome! Renee and her band of awesome musicians really made our wedding the party that we wanted! They were super willing to work with whatever we wanted and made sure that everything was going the way we wanted it too. 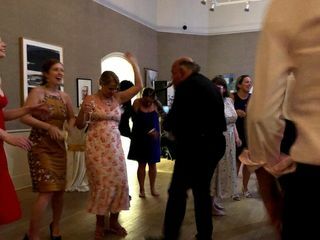 Our dance floor was packed all night long and our guests couldn't get enough! We have worked with Shaded Soul many times and continue to come back to them because not only do they pay attention to our event needs, they are able to go with the flow and make things happen as well. We are love live music and everyone in the band and working with them is a breeze. 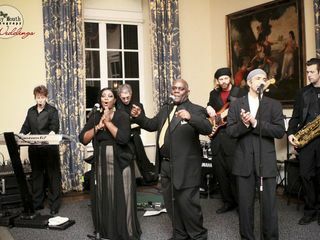 Thanks to Shaded Soul Band our wedding reception was fantastic and our guests danced nonstop! We received numerous compliments on the performance and song selection. They are by far the best local band I have heard and its members know how to get a crowd moving! The band members are exceptional musicians and vocalists and perform a wide variety of songs. They even learned and played a special song for our parents that we requested. Renee is excellent to work with and made planning our reception easy. I can't say enough about Shaded Soul Band. Hire them, you won't be disappointed! We enjoyed them so much that we attend local events when they are performing and can't get enough of their positive energy and talent. Renee and Shaded Soul were amazing on all accounts! Incredibly easy to work with and more importantly, they MADE the party with their music! Awesome service! Music was on point and all members were friendly. Definitely would recommend for a elegant wedding. 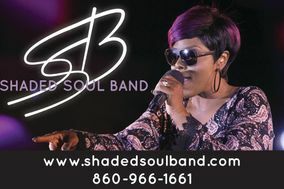 Shaded Soul is a fantastic and extremely talented band! Renee met with us early on in the planning process to discuss music preferences, song selections, and reception schedule. The band was very professional, personable, lively, and passionate. They were able to please all generations at our wedding and had everyone on the dance floor! Everyone at our wedding commented on how they loved Shaded Soul and enjoyed singing and dancing along to the music. Thank you from the bottom of our hearts. You made the night unforgettable and brought an energy that only Shaded Soul can provide! They were fabulous! They kept the party going from the first song to the last dance and Renee was wonderful to work with. Our guests are still raving about how great the band was. I attended a fundraising event for the LGBT community that Shaded Soul performed at. The dance floor was packed all night long. They played so many songs without stopping that my friends and I had to take a break because we were exhausted! I would recommend Shaded Soul to anyone because not only did they play my favorite Motown hits they also played several of the songs that are currently on the radio now. Shaded Soul Band is great! Band members are energetic and engage their audience. They play all types of music including dance music. Extremely talented band/entertainers. I will definitely be working with Shaded Soul in the future! Shaded soul was great! They did a great job and really got everyone up and moving. Many of our guests raved how awesome the band was and really enjoyed their sound. They were very professional and had several calls with us before the wedding to coordinate and just even to see how our planning was going. They were also extremely accommodating and learned a couple of songs specially for us. Only compaint is that they took too long of a set break at the height of dancing and many guests left at that point thinking maybe the reception was over or winding down. those who stayed had a real treat after but it was disappointing to have that downtime. Overall a great band, very reasonably priced, and would definitely recommend.